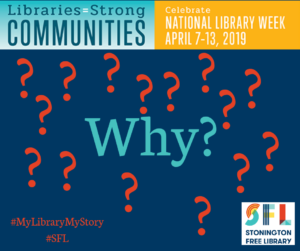 National Library Week – Why Libraries? Libraries are important cornerstones of a healthy community. Libraries give people the opportunity to find jobs, explore medical research, experience new ideas, get lost in wonderful stories, while at the same time providing a sense of place for gathering.